Cao Lãnh (Vietnamese: [kaːw˧ lajŋ̟˧˨˧] ( listen)) is the capital city of Đồng Tháp Province, Vietnam. It is located at around 10°28′2″N 105°37′49″E﻿ / ﻿10.46722°N 105.63028°E﻿ / 10.46722; 105.63028. During the French colonial period Cao Lãnh found some supporters for the nationalist appeal of Trần Huy Liệu's Đông Pháp Thời Báo (Indochina Times) founded in May 1923. Later, in initial resistance to the French in 1945, the Việt Nam Quốc Dân Đảng and others in the South formed into the Third Division of the popular army. Cao Lãnh was where the troops were reorganized into 23 units each of 500-600 men. 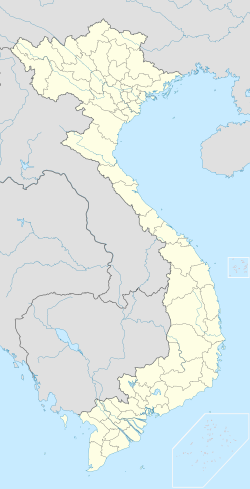 Prior to 1975, Cao Lãnh was the capital of the Kiến Phong province, in the Mekong Delta region of South Vietnam. 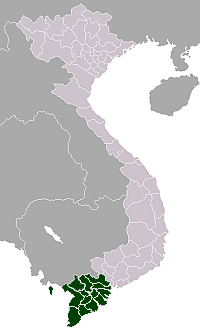 In February 1976, Kien Phong was merged with Sa Đéc Province to become Đồng Tháp Province. Sa Đéc became the capital city of the new province. Cao Lãnh replaced Sa Đéc as the capital since April 24, 1994, and became a city since October 2007. ^ Philip Taylor - Modernity and Re-Enchantment: Religion in Post-Revolutionary Vietnam 2007 Page 180 "The following year, under Master Minh Trí's leadership, she and a group of about one hundred families moved to Mỹ Phước, an area in Cao Lãnh district of the Đồng Tháp province, where new canals had not long been dug." ^ Philippe M. F. Peycam The Birth of Vietnamese Political Journalism: Saigon, 1916-1930 2012 Page 146 "A correspondent named Nguyễn Hỏang from the southern city of Cao Lãnh had taken up the political appeal initiated by Liệu. The time had passed for “arrangements.” The Vietnamese wished to enjoy the same rights as other free people, ..."
^ Van Dao Hoang Viet Nam Quoc Dan Dang: A Contemporary History 2008 Page 262 "The Third Division's forces increased to 15000 men when it arrived at Cao Lãnh. They were then reorganized into 23 troops (Bộ Đội), each with 500-600 men." This page was last edited on 9 April 2019, at 13:16 (UTC).